It all began at a farmers' market in Portsmouth, New Hampshire. From the start Jim Stott and Jonathan King wore many hats. Setting up shop in Jim’s family summer cottage, they spent endless hours cooking, hand-writing labels, taking photos and selling products. Often it became a full family affair: nephews and nieces filled jars one-by-one, Jim’s 90-year-old grandmother, Pearl, helped glue burlap onto jar lids and Jonathan’s mother worked as a store clerk. 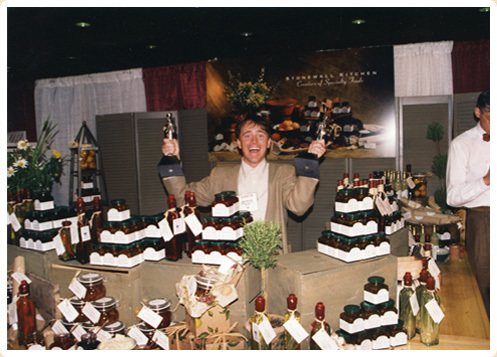 Over the years, we’ve received 29 prestigious awards from the Specialty Food Association, including three Outstanding Product Line Honors. In 2015, we were honored and grateful to be inducted into the Specialty Food Hall of Fame. We sent our first catalog mass mailing. Stonewall Kitchen moves to York, Maine. 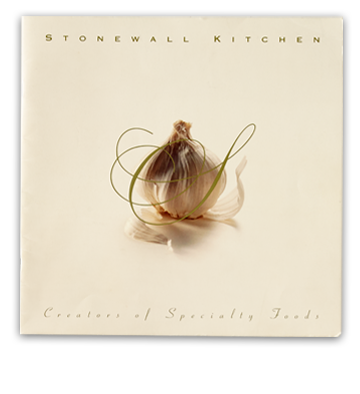 “Our Stonewall Kitchen Headquarters and Company Store has become one of Maine’s largest tourist destinations. We welcome over 500,000 visitors each year." jars for the farmers’ market to about 75,000 jars daily. for the farmers’ market to about 75,000 jars daily. Our Cooking School is born! 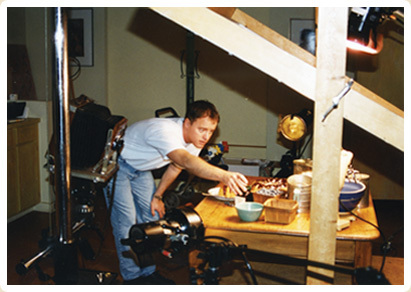 state-of-the-art culinary experience at our York, Maine, location. We encourage our guests to come eat, shop and learn with us." Astronaut and Maine native, Chris Cassidy, requested our Wild Maine Blueberry Jam because it reminded him of home. What’s better than toast? Chris Cassidy enjoyed his jam with a piece of space cheesecake! We created a special space-safe jar made from a natural polypropylene material. 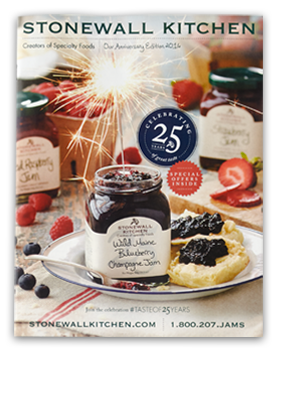 Stonewall Kitchen celebrates our 25th Anniversary! 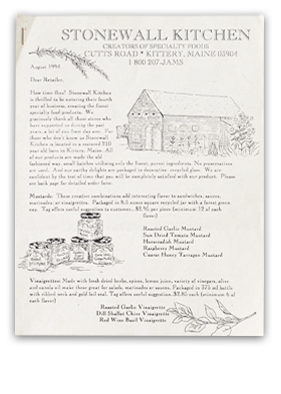 We welcome Tillen Farms to the Stonewall Kitchen family.